All songs by Donovan P. Leitch, except 08 lyrics by William Shakespeare, music by Donovan P. Leitch. · Donovan: vocals, acoustic guitar, harmonica, banjo and whistling. · Eric Leese: electric guitar. · Cliff Barton: electric bass. · Ken Baldock: string bass. · Jack Bruce: electric bass on Someone Singing. · Tony Carr: drums, bells, conga, turkish and finger cymbals. · "Candy" John Carr: conga and bongo. · Donovan started composing these songs when he retired to the English woods in the spring of 1967, with his American girlfriend Enid Stulberger, who was pregnant with their first child. · Although Mickie Most was credited as producer of the entire album (he did produced the single Wear Your Love Like Heaven/Oh Gosh) it was actually Donovan who produced the majority of the songs. Most was credited to increase sales. · Epic Records insisted in releasing both records from A Gift From A Flower To A Garden also as two separate albums in the US. The first record was released as Wear Your Love Like Heaven, and the second record was released as For Little Ones. This wasn't Donovan's idea: he wanted to release a box set with the two albums. Separately the albums charted #54 and #185, while the box set reached #15. The separate albums didn't chart well as people preferred the nifty box with the beautiful lithographs. The box set was released in the UK in April 1968. · The album cover shows an infrared photo of Donovan on the moat in front of Bodiam Castle, England, by Karl Ferris, who was his and Jimi Hendrix's personal photographer. It required six colour separations for printing, instead of the usual four separations. This image was the origin of the famous Donovan's "head icon". 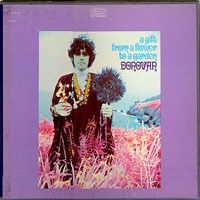 The back cover was also a shot by Ferris in LA, during Donovan's and Karl's initiation into Transcendental Meditation, and depicted Donovan visiting with Maharishi Mahesh Yogi. There are more photo shots from this session in the Bodiam Castle and even a short movie called Wear Your Love Like Heaven, in which appears Jennifer Boyd, for whom Donovan wrote Jennifer Juniper. · The box set is a very special item for collectors. The first box included the lyrics to the first album printed on a light green background and a Donovan's poem: Oh, What A Dawn Youth Is Rising To. This explains the meaning of the title of the album: the "gift" is the album, the message of love from the songs. Donovan is the "flower" and is presenting his gift to all the other flowers, the people in the world, who make up the "garden". The second box included an orange folder containing twelve inserts for the twelve songs on the second record. Each one has a slightly different colour and has the lyrics with a drawing illustrating the song. Every one is a beautiful interpretation of Donovan's poetry. The design of all the inserts was created by Mick Taylor and Sheena McCall. · In the album's notes Donovan explained his intention of creating two different albums: one for the present generation and the other for the "dawning generation", and denounced the use of drugs. In his new songs Donovan promoted the use of meditation and other techniques. · For Under The Greenwood Tree Donovan used the lyrics from a poem by William Shakespeare. At first the song was written for a stage production of the Royal National Theatre. At the end of the song, Donovan sings "Will you, won't you... join the dance?" in reference to the chorus of The Lobster Quadrille, in chapter X of Lewis Carroll's Alice's Adventures In Wonderland. · Mad John's Escape is dedicated to a friend who escaped from a mental institution and is about his escape and adventures. · Donovan composed two different songs named The Land Of Doesn't Have To Be: one of them was an out-take from the Sunshine Superman album, and the other one is included in A Gift From A Flower To A Garden. · Epistle To Derroll was dedicated to his friend, banjo player and singer Derroll Adams, who was a big influence on Donovan. · Some of the later reissues list Someone Singing as Someone's Singing.